C.S. Lewis, the author of Mere Christianity, was the greatest Christian apologist of the twentieth century. He also wrote works of fiction, including the Chronicles of Narnia, and of philosophy, such as The Abolition of Man. An Introduction to C.S. 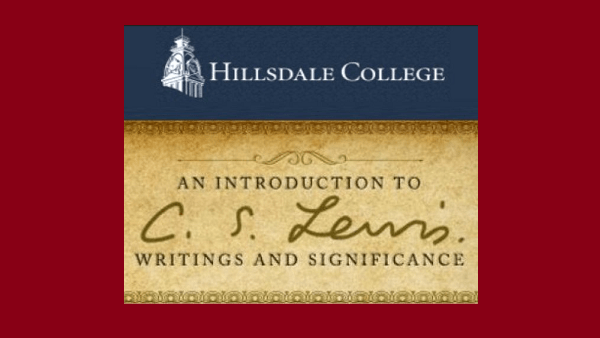 Lewis : Writings and Significance is a free, nine-week not-for-credit online course that examines Lewis’s apologetics and his fiction, as well as his philosophical and literary writings, and their continuing significance today. Activate your course today, for free! The course is taught by Larry P. Arnn, the twelfth president of Hillsdale College; Michael Ward, a leading expert on the works of C.S. Lewis; and David Whalen, Hillsdale College professor of English. Why does Hillsdale offer this C.S. Lewis course for free? Hillsdale offers this course because they hope more people will experience the truth and beauty of C.S. Lewis’ writings. His works of apologetics and fiction represent one of the finest sustained defenses of Christian principles in modern times. This course is funded entirely by the generosity of donors, who help keep it free to anyone who enrolls. For more information or to register for the class, visit http://info.hillsdale.edu/cs_lewis. Hillsdale College, founded in 1844, has built a national reputation through its classical liberal arts core curriculum and its principled refusal to accept any federal or state taxpayer subsidies (even indirectly in the form of student grants or loans), which allows the College to remain truly independent. It also conducts an outreach effort promoting civil and religious liberty, including a free monthly speech digest, Imprimis, with a circulation of more than 2.9 million.